Wetlands in Vietnam are under threat from both natural factors and human activities. U Minh Thượng in the southern province of Kiên Giang is one of eight wetlands in Vietnam that are recognised as Ramsar regions. Wetlands in Vietnam are under threat from both natural factors and human activities. Wetlands occupy an important place in the development of the country and are a key source of income for local communities. With a total area of nearly 12 million hectares, accounting for 37 per cent of the country’s total land, wetlands benefit all economic sectors. At present, many wetland areas have reduced in size. Some have become degraded or polluted, while others are not being used sustainably, requiring effective conservation and wise use. Experts say that unsustainable use of wetland areas is a major threat to their conservation and management. Associated Prof. Nguyễn Thị Thu Hà, from the University of Natural Sciences, said that the degradation and reduction of wetland areas has been occurring more rapidly than other ecosystems due to major changes in land use and construction, as well as the impact of climate change. “The area of seagrass has shrunk by up to half due to human activities including destructive fishing, aquaculture and tourism,” Hà said. “Natural calamities, abnormal changes in the flow of water and transport of alluvium and sediment in rivers in flooding seasons were also severe threats to the seagrass,” she said. Over the past five years, the coastal province of Khánh Hòa has lost 30 per cent of its seagrass area. In the waters off Quảng Ninh and Hải Phòng, seagrass areas have completely disappeared due to coastal construction projects, she said. According to a study by the Oceanology Institute, coral reefs have also been affected by overfishing, sediment accumulation and pollution. The reduction in natural wetland areas is also down to rice production, aquaculture, reservoir construction and mineral exploitation, the study said. Along with shrinking areas, the wetlands face serious degradation caused by industrial waste, oil and chemical substances used in agriculture and aquaculture production. Reports on the national environment status released by the Ministry of Natural Resources and Environment showed that industrial and export processing zones (IZs and EPZs) in the southern region discharged to the Đồng Nai and Sài Gòn rivers over 111,600cu.m of wastewater. Solid waste accounted for 15 tonnes, with 1.6 tonnes of nitrogen and 500kg of phosphate. Meanwhile, the rising use of plant protection substances in the Hồng (Red) River Delta region was alarming, said experts. The content of the chemical substances measured at the mouth of the Hồng River was 23 to 28 times higher than the norm. This was one of reasons for recent incidents of fish dying en masse in rivers and waterways. Along with human activities, climate change is putting pressure on wetland ecosystems. 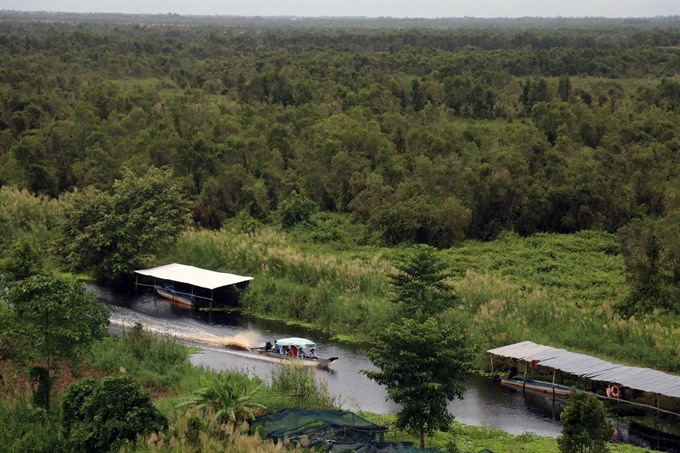 “Rising temperature impacts some animals and plants while less rainfall makes wetland areas shrink and increases greenhouse gas emissions due to the decay of organic substances, especially peat,” Học said. Rising sea levels lead to a reduction in wetland areas. Climate change will result in changes of water levels in wetland areas, which will alter the main functions of the wetlands, including the structure and components of the creatures living there, he added. Wetlands are in danger but conservation work is not yet effective due to a lack of investment. Conservation work is often funded at a local level, meaning there is not enough cash to do proper monitoring, data collection and evaluation activities, Học said. So far, eight wetlands are recognised as Ramsar regions, namely Xuân Thủy, Bàu Sấu, Ba Bể, Tràm Chim, Cà Mau, Côn Đảo, Láng Sen and U Minh Thượng. However, due to insufficient regulations, the wetlands are still shrinking. Vietnam has issued more than 500 legal documents on environment protection and preservation. But there are just 10 documents about wetland management and conservation. The country has formed some community-based management and conservation efforts for wetland areas, such as management of mangrove forests in Quảng Ninh Province, protection of nipa forests in Quảng Nam Province, management of resources among national parks and Ramsar regions of Xuân Thủy in Nam Định Province and Tràm Chim – Bird Park in Đồng Tháp Province. However, the management works have exposed some shortcomings. The Ministry of Natural Resources and Environment was not the only authority controlling activities in the wetlands. In fact, the Ministry of Agriculture and Rural Development was assigned to manage the wetlands in terms of rice cultivation, salt production, aquaculture, forest preservation areas, irrigation works and reservoirs. Meanwhile, the Ministry of Transport was responsible for transport activities on rivers. And the Ministry of National Defence controlled security issues in coastal wetlands. The management and conservation works have not yet progressed due to a lack of co-operation among the concerned units. According to Associate Prof. Nguyễn Thị Thu Hà, one of the key factors for sustainable development of the wetlands was to ensure a stable livelihood for local people. “The stable livelihood includes eco-agriculture, eco-fishery, eco-tourism and community forestry,” Hà said. Eco-agriculture means developing environmentally-friendly production combined with industry to ensure stable productivity, Hà said. To achieve effective management and conservation, it was necessary to set up policies and development strategies for the wetland areas, Hà added.